How do you decide what Flowers to make into Flower Essences? Most of the decision making is out of my hands. I talk to the Angels and Elementals everywhere I go and most certainly in the gardens here, and they point me in various directions. Sometimes they get my attention by having a Flower fill my heart with overwhelming love. That’s a nice nudge! In any case, I know from long experience that the Angels and Elementals have perspective about what Flower Essences are needed, so I follow their lead. Their guidance can be succinct, but there’s still a fair amount of mystery involved. Often my partners don’t tell me too much about the whys of growing a new Flower for an Essence or the whys of a new garden design. From three decades working this way, I know one of the reasons for this is that I have things to learn as the gardens unfold, and it wouldn’t help my process if they said, “Okay this garden is going to harvest a Flower Essence about letting go and you are going to have a season of doing nothing but let go.” This kind of heads up might take the wind of out my sails for one thing! For another, it really becomes shared wisdom through this process. The Angels and Elementals already know the vibrational strengths of each of the Flowers, but I get to learn this as I grow the Flowers and experience the gifts each Flower bring to the gardens and my life. I may not go to school each September anymore, but I feel the growing season is my classroom with a syllabus given in January, projects begun in February, great intensity of learning in the summer then a harvest of both Flower Essences and what I have learned in September and October. When the Angels and Elementals ask you to make a certain Flower Essence, is this always a straightforward process? Not at all. Sometimes it is hard to find the Flower. Sometimes it takes awhile to grow the Flower for the Essence. Some Flower Essences come completely out of the blue. This year saw a couple of different examples of this. Some Flowers I had been trying to make into Essences for a number of years were finally landed. With Artichoke Flower Essence, I had seen beautiful Artichoke Flowers in Ireland on a number of visits. It was my first nudge to grow the Flower. Artichoke Flowers are the edible chokes that have gone by and bloomed. 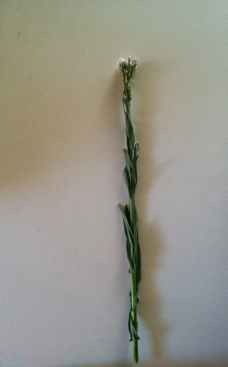 An extended growing season, the kind Ireland has, is necessary to get a Flower. 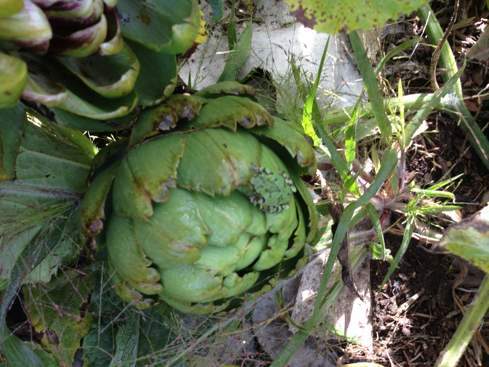 My first attempts to get the plants to blossom in our shorter growing season failed as I got artichokes but no Flowers. 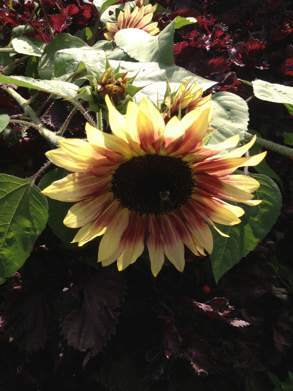 I tried numerous varieties and started the plant earlier and earlier in the greenhouse. Last year, the Artichokes went to flower, and I was euphoric. However, after a day in the garden sunshine, the bowl of Artichoke Flower Essence was drained, and I could just see the tail of one happy neighborhood dog trotting out of sight after drinking the entire bowl of the Flower Essence! Those were the last Flowers of the season on my Artichoke plants so I had to start over again this season. This year, I hardly let the Artichoke Flowers out of my sight until the Essence was safely in the bottling room. Woad was another Flower the Angels and Elementals suggested I grow several years ago, but I had never seen it before I grew it. 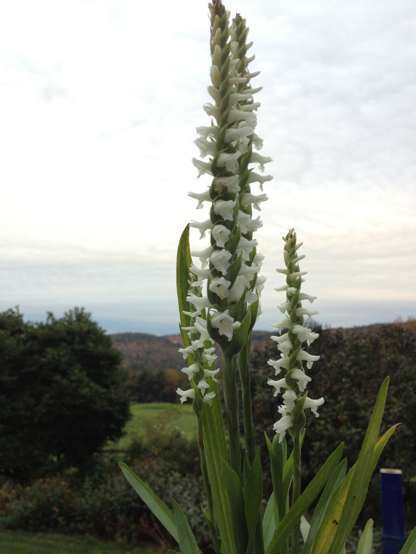 The plant is a biennial, taking two years before it blossoms, but what a blossom! I was very happy with our Woad harvest this season and am delighted that the plant has now self-seeded throughout Ben’s grape vines for continued harvests down the road. The Colorado Wildflower Essences were the “out of the blue” project of the season. Alli Howe, the GHF staffer who made them, has been working here at the farm with a great openness to partnership with Angels and Elementals. Alli has a lot of Elemental energy about her as well, meaning that she has a close connection to the divinity in the natural world through long association. 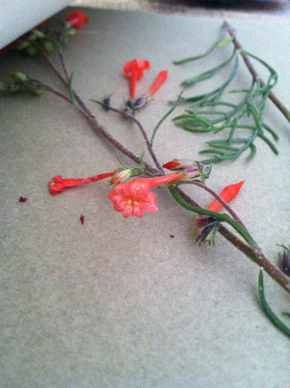 When she went back this spring to where she had lived in Colorado, the Angels and Elementals encouraged me to encourage her to make Flower Essences. She had the momentum for this kind of work and was joyful about doing it. How grateful I am that she was willing to follow the Angels and Elementals all over the mountains to find such dynamic Wildflowers. One of the things the Angels have always said about Flower Essences is that they are a way for those of us who don’t travel or can’t travel to fully experience the energetic gifts of other places and regions. 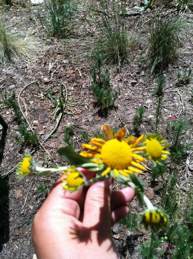 These Colorado Wildflower Essences are such a wonderful example of this. 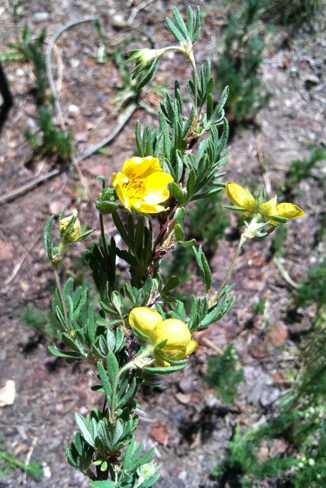 They bring us the resilient, determined, focused, clarified wisdom of these high mountain Wildflowers. What a blessing that Alli has taken to working with Angels and Elementals like a duck to water as the quality of the Essence really depends on this communication. This was also true of the two Essences from northern California, Redwood and Sweet Annie. 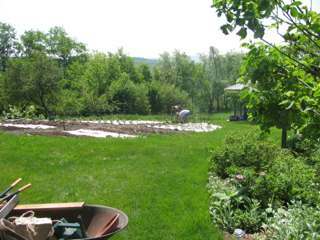 The Angels and Elementals asked me to ask long time Green Hope Farm friend Diane Chira to work on Flower Essences for Green Hope Farm and she committed to the project with such dedication and focus. She too was a natural, and I am most grateful for her work. How does a New Collection come together each year? The Angels and Elementals see to that in no uncertain terms. 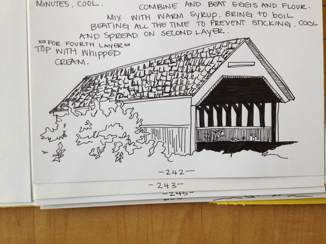 After working on the Green Hope Farm Cookbook at a leisurely pace during the summer Alli and I renewed our focus on the project during September. With papers and supervisory cats spread out on several large tables in the kitchen, we wrote and illustrated this book, hoping to wrap the project in time for a fall printing. I had told the Angels and Elementals that I would get definitions from them for the new group of Flower Essences as soon as the Cookbook was finished and off to the printer. Apparently the Angels and Elementals wait for no deadline! Suddenly Alli was like a whirling dervish. After staying up to the wee hours of the morning, she would arrive each morning with pages of pages of illustrated recipes. I think the Angels and Elementals were filling her with so much energy that she hardly needed to sleep. 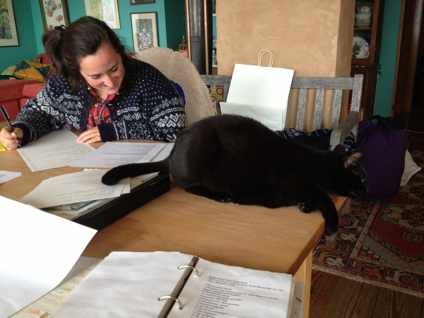 And her cat, Penny was supervising as well while our Bella worked the day shift here! With Alli setting this electric pace, we were able to finish the Cookbook very fast. And just in time as even during the final days organizing the Cookbook for the printer, the Angels started explaining the new Essences to me at all times of day and night. I could feel them leaning in, like an energy at my back, pressing me to get the definitions they were giving me on paper and out to you. I started to carry a book with me everywhere I went to write down everything they were telling me. Much of the year our conversations are more relaxed and they usually don’t interrupt me whatever I am doing (even when it is some extremely mindless and silly occupation that I am sure they know is a complete waste of my time). But they KNOW when the new Flower Essences are needed for humanity and they KNEW these were needed NOW. Consequently, the process of transcribing the descriptions of this year’s new Flower Essences went incredibly fast. I mean, how hard is it to type dictation? And that was how these definitions were flowing. I think this is partly due to the number of years I have now been talking to Flowers and the Angels and Elementals and also partly because these Essences needed to be launched ASAP so I was given extra help. They even sent in data in crystal clear dreams! 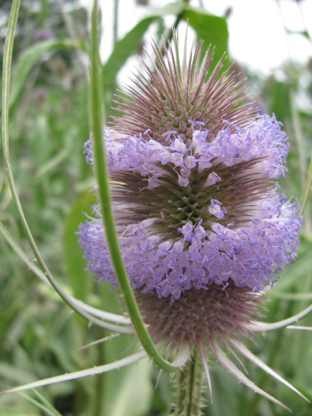 Sometimes it can take me MONTHS to delve into a Flower and hear what it has to say about itself- NOT THIS YEAR! This group was READY! How do you view this new group of Flower Essences? WOW! They are just so different than last year’s new introductions and for many reasons. I see this as most heartening. Last year’s new Essences offered wonderful support for fine tuning our electrical system especially our upper chakras. I felt we were getting help to receive new high vibrational energies and assimilate them. The New 2013 Essences couldn’t be more different in feeling or purpose. They have a roll up your sleeves and get going energy that is strong, practical and accessible. They have very specific gifts to help us with humanity’s overarching process of unity consciousness and their energy suggests the time for this work is NOW. It is one thing to bandy back and forth this term, unity consciousness, in a world that feels a long way from unity anything. But I remember in the early ‘80s how the world seemed on the brink of nuclear war and how bleak that felt. I was a part of citizen to citizen peace exchange with folks from Russia. I made friends with some very sweet Soviet women who mostly wanted to go right from the airplane to JC Penney’s to get properly fitting bras and then sit back and talk about foraging for mushrooms on their weekends in the country. But could small groups of humanity like this really help keep the world from nuclear war? Yes and it was a movement of ordinary people living out the theory of the hundredth monkey. So too with unity consciousness. Despite what seems to be happening on the surface, other forces are at work. I find these Essences extremely encouraging in this regard. They don’t suggest that we pay any attention to what seems to be the reality but instead, they help us dive into a new experience of reality. They also offer concrete support for moving beyond apparent differences and relationship roadblocks that break down unity consciousness. They are Flower Essences that seriously have our backs as we do this work, and they speak from a place of great confidence and certainty that LOVE AND UNITY CONSCIOUSNESS WILL PREVAIL. I for one am very heartened by all they offer us and the reality they suggest is revealing itself in our midst! The New Flower Essences for 2013!!! In 2012 Green Hope Farm’s New Flower Essences focused on fine-tuning our upper chakras for radical change by improving our ability to receive and integrate higher vibrations. These Essences help us to stay in sync with the planet’s rising vibration. Green Hope Farm’s 2013 New Flower Essences support us to take our tuned up vibrational systems out for a spin to clarify and deepen our spiritual work on the planet. Many of this year’s New Flower Essences are about process and using our increased vibrational wisdom in concrete ways. These Essences signal a planetary shift from preparation to action. I’ve given short definitions for all the new introductions followed by longer definitions for these new ones so you can more quickly sort out which ones are calling to you. The photos of the Flowers are with the longer definitions. Many of our New Flower Essences this season are Colorado Wildflower Essences. Made at an elevation of 10,000 feet, these Colorado Wildflowers come from near the town of Blue River in Summit County, Colorado. We have Alli Howe to thank for these superb new Wildflower Essences. Not surprisingly for a collection made at such high altitudes, this group of Wildflower Essences offers roadmaps for enhanced perspective, clarity and discernment. The group also shows us how to work clean energetically especially during and after conflict. Most importantly for these times, the group helps us feel the underpinnings of the eternal on the higher slopes of the spiritual path. 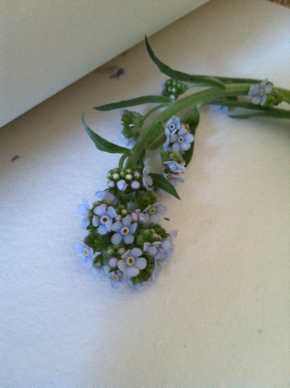 Alpine Forget-Me-Not– Eritrichum areteum Discernment about what is our spiritual business and what is not. I AM balanced love in action. Alpine Pennycress– Noccaea montana Experiencing life from a big picture point of view. I AM a clear experience of divine truth. Astragalus– Astragalus alpinus Pulls us out of mucky swamps of temporary pursuits and pleasures to ground in eternal identity. I AM the only real thing. Blue Penstemon–Penstemon In arguments, helps us be silent when our impulse is to say something to prove we are right. When we do speak, it helps us speak from our common divinity versus from an illusory place of separation and conflict. I AM a constructive and meaningful participant in all dialogs. 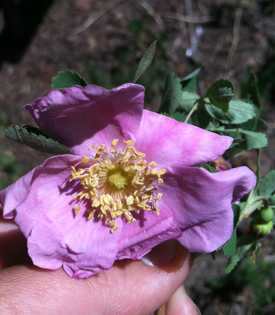 Colorado Native Rose– Rosa woodsii Trust in where our spiritual path takes us. I AM in the expansive embrace of the eternal. Fairy Trumpet– Ipomopsis aggregata Support from the Elementals to experience the elemental, grounded, ordered, eternal underpinnings beneath chaotic events. I AM grounded amidst chaos. Fendler Groundsel– Packera fendleri By firing along the electrical circuits that connect us to each other, Fendler Groundsel helps us be less reactive to new allergens as well as new ideas or people who push our buttons. Like the smoothing of ruffled feathers, Musk Thistle moves through our subtle bodies to restore order after any big emotional, mental or spiritual release in the physical body. I AM the restoration of all my electrical circuitry. Clarity, common sense, a sturdy sense of practicality and resolve, even a sense of humor on the spiritual path. I AM on my way. Nothing can stop me now. Helps alleviate sinus related issues, harsh self-judgment, pressure filled expectations. I AM a release from all self-loathing. I AM at peace with who I AM. I AM the clear flow of all electrical data throughout my energy system. The immense and palpable vibrational love and support of Redwood, helpful for shattered families or those in need of strong support from a mother or father figure or wise elder. Helps us know the temporary quality of our troubles and anchors us in the eternal love we will always exist in. I AM the Peace you seek from the Time before Time. Strong support to wake up and know I AM one with God. Sanctuary to feel what we feel, opens a space for natural resolution of conflict to occur. In all my relationships I AM anchored in restorative love and truth. Beyond Lyme- The Angels of Green Hope Farm’s combination Flower Essence remedy for Lyme disease and the spiritual threshold it represents for humanity of moving beyond the illusion of other. 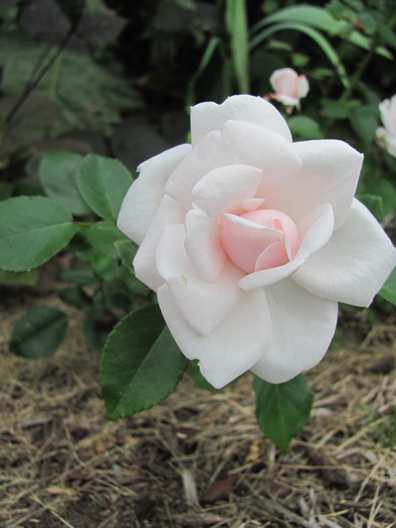 Climbing New Dawn Rose– Rosa New Dawn Helps us know the eternal reality of love that is the matrix and evolutionary force within everything. I AM the New Life eternal. Support to surrender everything into divinity’s hands thus allowing the grace of divinity to arise and bring resolution. I AM Grace. The Hummingbird Garden– A mix made from an amazing garden, this one encourages bold choices and a joyful embrace of what grows when we plant our dreams. Especially supportive for the current generation of twenty-somethings. Love It and Leave It– This year’s Venus Garden combination remedy supports us to give our lives our all yet not take the results so seriously. Helps us experience the happiness that comes when we understand no outcome defines us. Supports us to find the eternal and immutable in the momentary and passing and let go of the rest. Support to transform obsessive, fanatical or unbalanced emotional into balanced, centered and creative love. I AM Love untarnished. A very wise ally, Queen of Night illuminates where we are and helps us navigate forward across any terrain no matter how dark, forbidding or tangled. I AM the way forward. Lifts us from the blues and helps us soak up the light, supports us to find new purpose when a former purpose has been lost. I AM Light pure, bright and true blue. Alpine Forget-Me-Not helps us discern what is God’s business, what’s someone else’s business and what is our own business so we can move through the world with both kindness and appropriateness. An excellent remedy for those of us who are focused on spiritual service and who want to serve in the most helpful way possible but find ourselves bogged down in the confusions and expectations of culture, religion or habit. This one helps us be clear in each now what we are meant to do and what we need to let go off. I AM balanced love in action. The point is always spiritual no matter how bogged down in the material plane events seem to be. 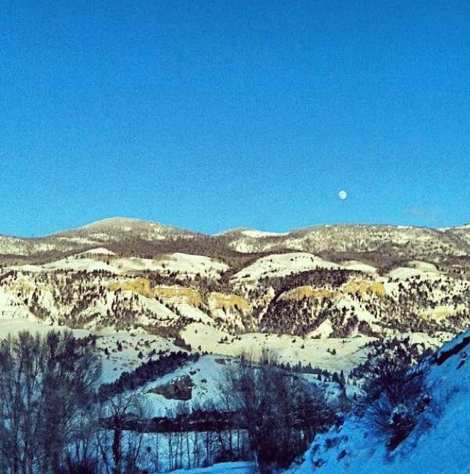 Alpine Pennycress wakes us up to this truth in a clear crisp way. Imagine seeing the planet from outer space. We would know it was more than just an accumulation of petty details and dramas. We would experience it as a big picture place. 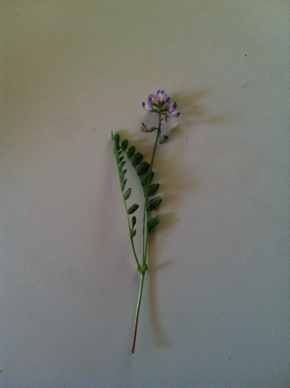 This is the wisdom of Alpine Pennycress. I AM a clear experience of divine truth. Also known as Locoweed, Astagalus is used extensively as a medicinal herb for many immune related issues. As a Flower Essence it loosens the hold that temporary pleasures have on us, thus releasing us to experience more deeply our eternal spiritual identity. Its energetic movement is a very strong upward force, pulling us up into the light and out of mucky energetic swamps that entangle and bog us down. This upward force helps us keep focused on spiritual reality not lose ourselves in illusionary pursuits and pleasures. I AM the only real thing. A compromise between two individuals or groups who see things differently often occurs when everyone participates in a genuine exchange versus an exchange that uses mind ideas to further prove one’s point. Blue Penstemon helps us to speak from a genuine place so that the relationship or situation moves forward towards compromise. 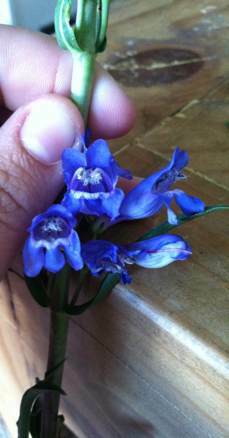 Blue Penstemon also helps us curb our tongues if we are tempted to say something just to establish we are right. The Essence accomplishes these two tasks by calming and aligning our fifth chakra energies so we speak from the place of oneness we all share: our common divinity. 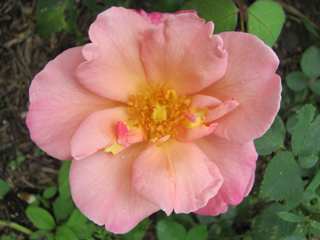 This Rose helps us trust even relax into the flow of our spiritual path no matter the unexpected or unlikely twists it takes. It helps us have an unshakeable confidence in our oneness with divinity throughout any upheavals and during times when our individual path takes us off the beaten course to unfamiliar terrain. This Flower Essence is a particular gift of the Elemental kingdom and offers their roadmap for experiencing the elemental, grounded, ordered, eternal underpinnings beneath chaotic events. 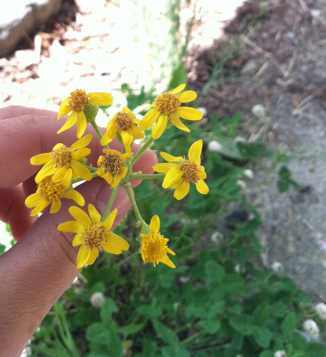 Fendler Groundsel has two different but interrelated strengths. It will help us be less reactive to new allergens so consider this one if a new allergic reaction crops up. It also facilitates any meeting of the minds by helping us to be less reactive to new ideas, different ways of looking at a situation or people that push our buttons. Fendler Groundsel helps us feel connected to each other during conflict with individuals or groups by actually firing and illuminating the electrical circuits that connect us to each other. It is an excellent remedy for any kind of group working on a joint endeavor and dramatically helps when consensus is necessary to achieve the desired result. 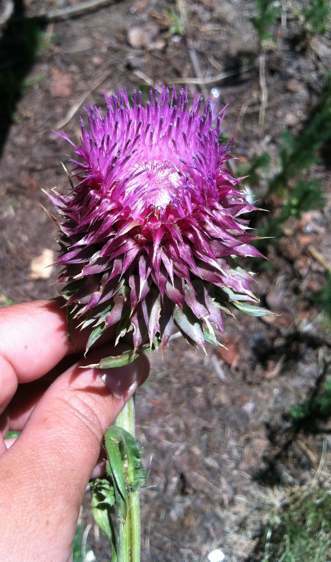 Musk Thistle improves the cleansing and restoration of our electrical fields after energetic work or a deep release of old traumas from our physical body. The physical body reflects everything we think, feel or know. It’s the physical storage bin for all our mental ideas, feelings and spiritual tangles as well as strengths. But these thoughts, feelings and spiritual strengths and weaknesses exist in our subtle bodies as well. These emotional, mental and memory subtle bodies are interpenetrating electrical systems that overlap and extend out from our physical body. When a release in the physical happens either intentionally during healing work or because some event has triggered a release, all our subtle bodies are called into play. This Essence helps calm and clear the physical body after a release and also helps the subtle bodies to clear and restore all connectivity. This one works almost like the smoothing of ruffled feathers, moving through our subtle bodies to restore order after any big emotional, mental or spiritual release in the physical body. I AM the restoration of all my electrical circuitry. The spiritual path can get murky, and sometimes we can get lost or sidetracked on trails that lead nowhere. This Essence helps us discern the wisest path for our feet to take and helps us proceed on this path with common sense, a sturdy sense of practicality and resolve, even a sense of humor. I AM on my way. Nothing can stop me now. Especially good for sinus related issues and any situation in which we judge ourselves harshly or lay upon ourselves pressure filled expectations. I AM a release from all self-loathing. I AM at peace with who I AM. A very thorough cleanser for all electrical circuits both the nervous system in our physical body and the circuitry in our subtle bodies. 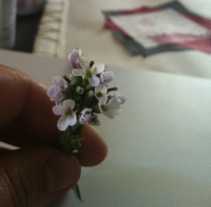 We have Diane Chira to thank for these wonderful Flower Essences from the Navarro River region in northern California. 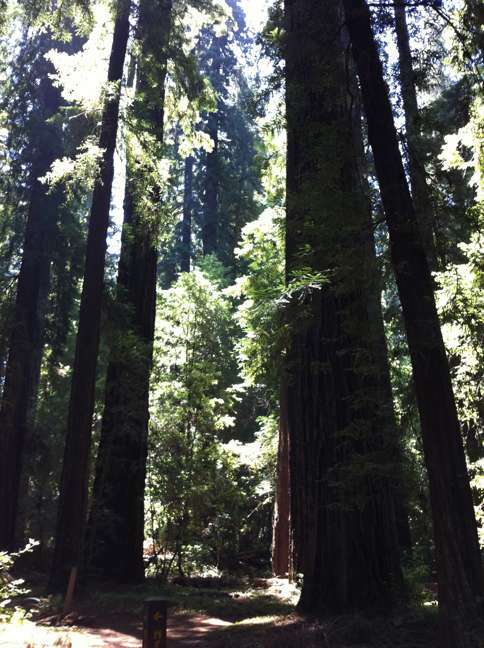 Redwood Essence helps us open and receive the complete restorative extremely wise and consoling love of the Redwoods. It is deeply healing for those from shattered families or those in need of strong support from a mother or father figure or wise elder. It offers its strength to the fiber of our beings. Redwood Essence helps us feel lifted from our present concerns into a timeless overview that reveals to us the temporary quality of our troubles and the eternal love we will always exist in. This Essence is a doorway through the illusory temporal world to an experience of the eternal now. No Redwoods were disturbed during the making of this Redwood Essence, but much time was spent working with the Redwoods to make this Essence. As with all Flower Essences, the participation of the Elementals and Angels- the divinity in Nature- was necessary for the Essence to exist and we thank the divinity in the Redwoods for this Essence. Until God realization, we are all in the fog about who we are. Sweet Annie works like a foghorn to awaken us to the truth that we always were, are and will be one with God. The dominant fragrance of this plant smacks one in the face. In a similar vein, the effect of this Flower Essence is to wipe out other impressions so as to clear the way for a full experience of our divinity. 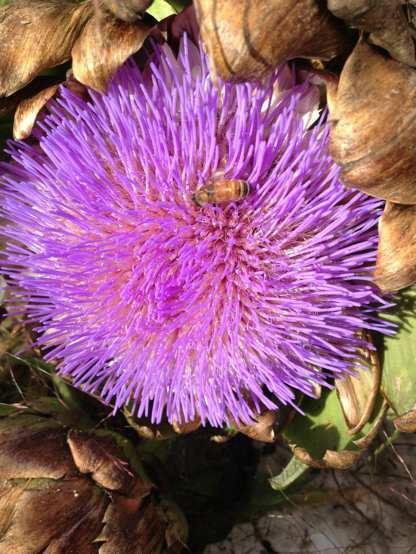 Artichoke is a gorgeous Flower of thousands of violet filaments contained within a rim of protective thistle leaves. Its Flower Essence echoes the Flower’s balance of protective sanctuary and expansive self-knowledge. After conflict or betrayal, there can be a lot of outside pressures to get over it and move on. Artichoke gives us the emotional space to feel what we feel and know what we know separate from these pressures. By creating this sanctuary, Artichoke helps us find resolution or closure from a place of natural flow. Whether this eventually brings a reconciliation between involved parties depends on who else is involved, but Artichoke helps us get clear about appropriate boundaries moment to moment as our own feelings about the situation evolve. Furthermore, Artichoke helps us trust the natural order of things with an electrical wisdom that neither pushes us towards a pressured and false forgiveness nor supports us to stay closed off because of old wounds. If reconciliation is possible, Artichoke brings confidence to this process, oftentimes revealing the way to genuine reconciliation even in unlikely circumstances. Artichoke knows that reconciliation can come naturally when not imposed on a situation from without. With the support of Artichoke, the relationship can be rebuilt if appropriate without coercion or false emotion. In all my relationships I AM anchored in restorative love and truth. Beyond Lyme– The Angels’ combination remedy for those dealing with Lyme disease and all of us working to cross the threshold to unity consciousness, a state of being in which the idea of “other” is dismantled, and we are free from any illusions that self and self interest do not encompass all beings. A longer explanation of this dynamic mix is available on our website and in a handout we are happy to send to you by email or in the mail. Of course, a copy of the handout is included with any order of this Flower Essence mix. Help us to keep the bead on the spiritual verities of evolution and change versus the disharmony that clamors so much louder but which is actually so much less real. It can sometimes be hard not to sink into disbelief that humanity is evolving. Climbing New Dawn helps us know the loving forces of change that prevail and that bring a new dawn each day. Climbing New Dawn Rose grounds us to the eternal reality of love which is the matrix and evolutionary force within everything. I AM New Life eternal. 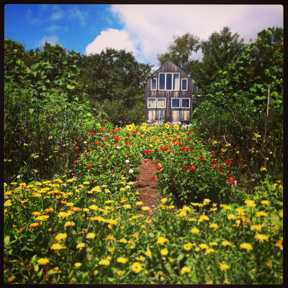 This growing season the largest garden space at the farm was given into the hands of the twenty somethings. Laura Carpenter designed the garden with the Angels then planted it with help from other peers particularly Alli Howe. 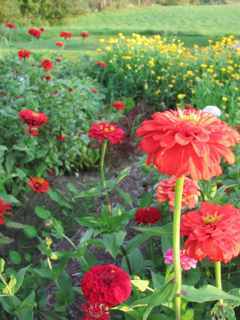 The garden was extremely bold in color with a pathway running north to south planted in many varieties of red Zinnias, yellow and orange Calendulas and miniature Sunflowers. 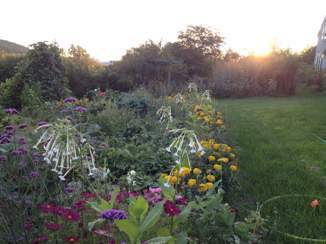 Brilliant purple Heliotrope, gleaming white Daturas, yellow pompom Marigolds and many other boldly colored Flowers encircled the garden while Cucumbers, Summer Squash, and Tomatoes were the predominant vegetables. A series of very tall Scarlet Runner Bean teepees swept across the entire garden from east to west covered in brilliant deep orange blossoms. One summer afternoon a deer was found napping in one of the teepees, but most often it was the hummingbirds in the garden that caught our attention. At any given moment there were up to a dozen hummingbirds zooming around this garden, performing their signature loop de loops, resting on top of the teepees, drinking in the nectar of the Flowers or simply playing tag. The combination of this bold exuberant garden and the joyful hummingbirds translated into a Flower Essences mix called The Hummingbird Garden. It supports twenty somethings and really everyone else betwixt and between to boldly plant and harvest our dreams, always remembering to relish and delight in everything that grows. For a generation in transition, often uprooted and unsure of the next place or next job or even if there will be a job, this Essence encourages confidence in bold choices. It encourages us to dig in, bond with the natural world and join in its creative dance. Like the Hummingbird, if we seek the Essence of things by following our dreams then savoring every moment of exploration, this will lead of its own accord to a life path, a community and a place in the world that is genuine, connected to the natural world and fun. Did we mention FUN? The Hummingbirds certainly did! Hummingbirds and the Hummingbird Garden Essence help us know we can manifest our dreams and that nature stands ready to support us to enjoy every moment of creation. 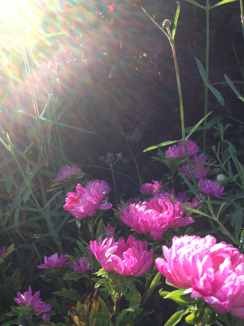 This year’s Venus Garden was a gorgeous seven pointed star of Pink Flowers primarily Zinnias with inner rings of Red Shiso, soft pink Sunflowers, Pink Cleomes and a center of White Eagle Corn. Between each star point was a spiral of Mehera Marigolds flanked by beds of Sweet Allysum. Even before we planted the garden, the Angels told me the Essence from this garden was going to be about that old chestnut: love with detachment. I rather dreaded trying to sort out the explanation for this confusing topic. When the Angels gave me the name for the Essence, Love It AND Leave It, I had to laugh. Paradox is like that! Yes, the path forward is to love whatever situations confront us ever prepared to give it back from whence it came. Fame, illness, best friends, worst enemy, success, failure: greet them all with poise, with care and with gusto, knowing at some point all will have to be relinquished. To show up, pay attention and do our best is the “Love It” aspect of this Essence. It is the full embrace of whatever challenges life gives us. To let go of outcomes is the “Leave It” aspect. To Love It and Leave It is not a justification for not caring. It is giving each circumstance our attention and best effort, but also detaching from how events turn out. This is loving with no strings attached. The letting go of outcomes aspect is key and one of the essential conditions for true happiness. Why is this so necessary to happiness? Real detachment is based on the unshakeable knowledge that all things of this world are momentary and passing. This knowledge releases us from the futility of trying to control outcomes. It releases us to genuinely enjoy whatever is happening without thinking it defines us. Nothing defines us but God. Real detachment leaves us free to discover the door in the center of the garden that leads to what IS unchangeable, and it ain’t fame or fortune. Focused love on divinity is our way through the momentary and passing to the absolute and eternal. A peachy pink, citrus scented, climbing Rose with a heart of yellow, this Rose is about love balanced by wisdom. Obsessive, fanatical or unbalanced emotional attachment to another person, to an idea or an activity can become softened and transformed into a balanced, centered and creative love with the support of Pink Pillar Rose. The transformative power of this Rose Essence is strong but extremely sweet. It is a gem. 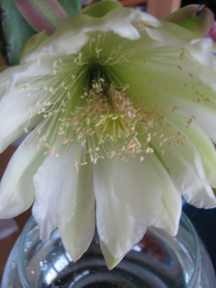 Queen of Night is a cactus from the Andes of Peru with a lot of personality. Working with her feels very much like being taken under the wing of a very wise crone. She blooms at night and her stunning white Flower lasts only the night. Her Essence brings us a single pointed focus in times of darkness or lack of clarity. Much like a match flaring in total dark, Queen of Night illuminates where we are and helps us navigate forward across any terrain we are hesitant to cross. Her light literally unknots and dissolves complications. Her light is focused and wise. As a plant extract, Queen of Night is used by Peruvian shamans for spiritual quests and to help pinpoint the nature of a disease process in an individual. This quality of discernment is part of her gifts as a Flower Essence, but she goes further still. She also shows the way to unravel the issue underlying any distress, helping us find our way forward unburdened into an experience of greater light. 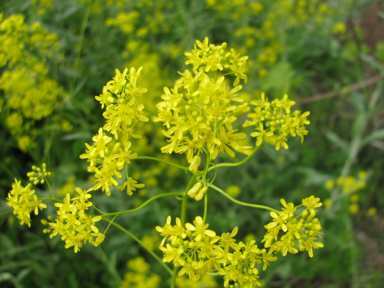 Woad is a brilliant yellow flowering plant used since Neolithic times to make blue dye. Woad was grown in large quantities in Europe for all blue cloth until a superior dye made from Indigo was imported from India in the 1600’s. This introduction of Indigo was contentious as the end of the Woad industry radically changed the economies of many European countries. 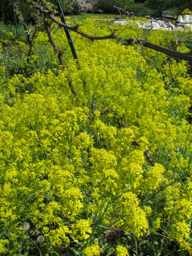 At present, the US views Woad as an invasive plant that should be eradicated. Europe, however, is rebuilding its Woad industries, using Woad as a dye for inkjet printers as well as a commercial dye as it is biodegradable and safe for the environment. 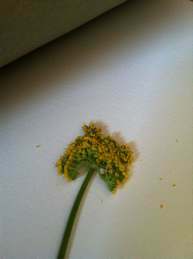 Woad Flower Essence has a very strong energy. It creates a very powerful clarifying energy in our mental, emotional and memory subtle bodies, facilitating the movement of a large amount of light into these fields and helping us absorb this light into our cells much as a sponge soaks up water. This makes us more resilient to difficulties and helps anyone suffering from depression or the blues as it quite literally reveals and illuminates the bright yellow sunshine that exists simultaneously with the blues. One particular gift is that Woad helps us find purpose when our previous purpose has been lost to us. I AM Light pure, bright and true blue. Change is the constant and this fall, change has kept us on our toes. First there is the weather. It’s about 70 degrees out tonight- as balmy as a midsummer’s eve and not exactly your typical late October in New Hampshire night. In the gardens this means that we don’t need to cut back the gardens yet. Everything is still lush and green. Flowers like Cosmos have relished this extended fall while some Flowers like the Sunflowers gave up the ghost anyways. Their time clock said it was time to be done with it, and so they were. 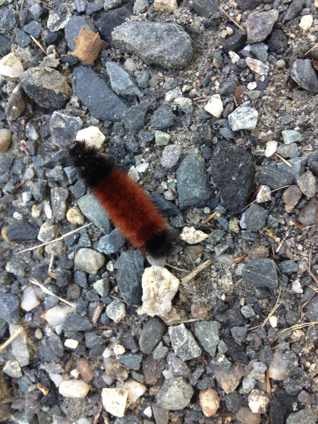 On the roads, woolly bear caterpillars are everywhere. Any walk is an exercise in saving woolly bears, stopping every few feet to pick one up and throw it to the side of the road. There seem to be a lot of lore about what the stripes on the woolly bears mean. This years their middle brown stripes are mostly very big which lore tells us means a mild winter. We shall see. Our experiment with honeybees in the barn has gone well. The two hives on the second story have thrived. Traffic has been steady as they zip off to a big patch of Mustard Flower down in the hayfield. The beehive that survived the bear was down to a handful of live bees and we despaired of it. Much to our delight, that handful blossomed into a healthy colony. The handful must have contained a living queen for this to have happened. The one worry about this recovered hive is that there hive is right outside the office windows where the bear attacked them in the first place. This makes them ripe for the return of Mr Bear. We would have moved this hive but you can’t move a hive less than four or five miles without the bees getting very confused about where is home. The colonies in the barn are new colonies that have only lived there. The bear killed all the other hives but this plucky one. Now we are trying a new method to protect them. Jim has put down sheets of plywood covered with two inch nails facing up. Another beekeeper swears this stops bears. Let’s hope this is true because it is the most menacing thing in our yard and one I can only hope none of the rest of us fall on. It is almost time to post the new Flower Essences for 2013. When it is time for the new Flower Essences of the season to be released, the Angels and Elementals pull out every stunt in their handbook to get me to get the definitions down on paper and the Flower Essences ready to launch. This year they have had many of you dreaming of some of the new Essences, calling with precise descriptions of what you are looking for in the new collection and of course, there they are waiting for you, just as you knew they would be. I hope to have the definitions posted in a few days. Really! I am close! 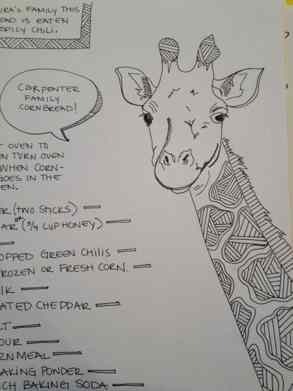 In the office, Alli Howe made a heroic effort to hand letter and illustrate a Green Hope Farm Cookbook- now off at the printers. All fall, Alli arrived each day with a new group of recipe illustrations, and we would all crowd around, ever enchanted by what she had drawn. Can’t wait to share this with you later this fall when it comes back from the printers. We named the book, The Things We Cook- A Green Hope Farm Cookbook! Another lovely occurrence in the office is the return of Lizzy who has come back to do email. She arrives at six in the morning each day to answer your queries and take your orders. Grace comes with Miguel a couple hours later and then I get a few hours with Grace before Lizzy finishes in the office. Lizzy is really enjoying this balance of visiting with you all and taking care of one year old Grace, and I am loving my hours with Grace. Next year she will be a more active participant in my Woolly bear Patrol. 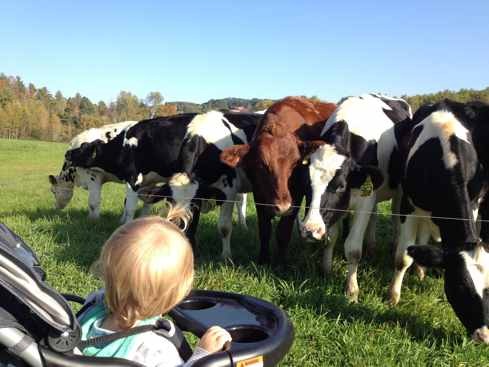 In the meantime she is quite enjoying our daily visit with the cows in the neighborhood.